Brain glutamatergic (mGluR5) receptors involved in aspects of addiction are reduced during chronic drinking, but normalize in sobriety and can be assessed to predict relapse risk. DENVER, Colo. (Embargoed until 2 P.M. MT, Sunday, June 11, 2017) – Alcohol abuse disorder is a devastating and complicated disease affecting millions of people worldwide. A study presented at the 2017 Annual Meeting of the Society of Nuclear Medicine and Molecular Imaging (SNMMI) reveals how brain receptors involved in the compulsion to drink, adapt to alcohol-dependency by reducing their bioavailability, but return to their normal availability after a modest period of detoxification. Receptor availability at the outset of sobriety could also serve as a predictor of long-term success. Researchers focused on metabotropic glutamate receptor subtype 5 (mGluR5) receptors, which are linked to memory, learning, and feelings of anxiety and craving, and are spread throughout the central and peripheral nervous systems. In the limbic systems of brains coming off a stint of heavy drinking, they found significantly lower mGluR5 receptors available for neurotransmission. This suggests that the brain is compensating for chronic alcohol abuse by biochemically turning down the urge to drink. “Lower mGluR5 bioavailability may represent a reversible and potentially beneficial neuroadaptation in alcohol-dependent subjects that helps to reduce cravings and risk of relapse during abstinence,” said Gil Leurquin-Sterk, MD, who worked closely with colleagues Jenny Ceccarini, PhD, first author, and Koen Van Laere, MD, PhD, lead author of the study from the University Hospitals Leuven and KU Leuven in Belgium. This study represents the first human positron emission tomography (PET) imaging study in which mGluR5 is evaluated in the brains of healthy controls and alcohol-dependent patients at different stages of alcohol abuse and sobriety. It included 32 healthy controls and 16 alcohol-dependent patients, who underwent PET imaging with the tracer 3-[fluorine-18]Fluoro-5-(2-Pyridinylethynyl)Benzonitrile (18F-FPEB) within two weeks of enrollment, and then at two months and six months of sobriety. Questionnaires evaluating craving were provided at baseline and again at follow-up, along with an analysis of hair ethyl glucuronide (a biomarker of alcohol consumption in the prior three months). 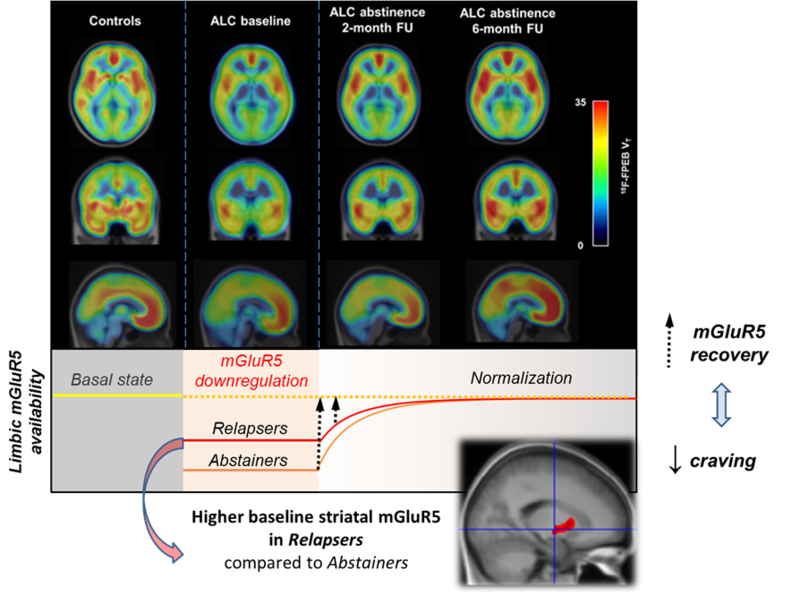 Even at the two-month mark, the brains of alcoholics showed signs of regained mGluR5 availability and approached full recovery after six months of alcohol abstinence, although the hippocampus, nucleus accumbens and thalamus did not recover yet. It is important to note that alcoholic subjects who had higher baseline mGluR5 in an area of the brain associated with habit formation—specifically the anterior putamen and internal globus pallidus (GPi) of the basal ganglia—were more likely to relapse within six months of follow-up than alcoholics who came into the study with lower mGluR5 availability. Researchers also found that, as lower mGluR5 in the anterior putamen and GPi recovered and approached levels of healthy controls, abstainers reported reduced desire and intention to drink and reduced negative reinforcement, indicating a gradual process of normalization. These results could be used to further investigate mGluR5 downregulation and other biomarkers for molecular imaging and the evaluation of novel therapies that could increase an alcoholic’s ability to achieve long-term sobriety. The National Institute on Alcohol Abuse and Alcoholism reports that in 2015 more than 15 million U.S. adults ages 18 and older had alcohol abuse disorder. Alcohol was deemed the fourth-leading preventable cause of death in America and led to approximately 88,000 deaths. Scientific Paper 14: “Recovery of decreased metabotropic glutamate receptor 5 availability in abstinent alcohol-dependent subjects,” Gil Leurquin-Sterk, Jenny Ceccarini, Koen Van Laere, Nuclear Medicine and Molecular Imaging, University Hospitals Leuven - KU Leuven, Leuven, Belgium; Cleo Crunelle, Toxicological Center, University of Antwerp, Wilrijk, Belgium; Bart de Laat, MoSAIC, Molecular Small Animal Imaging Center, KU Leuven, Leuven, Belgium; Guy Bormans, Laboratory for Radiopharmacy, KU Leuven, Leuven, Belgium; Hendrik Peuskens, UPC KU Leuven, Leuven, Belgium, SNMMI’s 64th Annual Meeting, June 10–14, 2017, Denver, Colo.